Coxswain Henry Freeman oversees the moonlit launch of the Whitby rowing lifeboat, circa 1890. The painting was inspired by Geoffrey Loy's musical The Shout which is based on the life of Henry Freeman. The fact that 2004 is the centenary of the death of this great Whitby character made it a perfect time to celebrate his life in this way. John Freeman has collaborated with RNLI Museum curator, Peter Thompson MBE, and Mike Shaw of the Sutcliffe Gallery to research and create this study of a lifeboat launch just prior to Henry Freeman\'s retirement. A forerunner of the Robert and Mary Ellis, the Robert and Ellen Robson was hauled from its place in the lifeboat museum to give a sense of scale and the efforts involved in the launching of this 5-6 ton boat and its carriage. 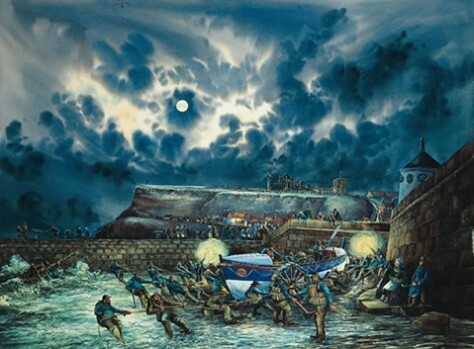 John Freeman then combined this anecdotal information, and the period dress of the lifeboat men of that time, gathered from the Sutcliffe Collection, to create this powerful image of Henry Freeman overseeing a launch from the slipway into the surf by the West Pier. Onlookers, wives and families watch on a cold blustery night as the crew and helpers launch the lifeboat into the debris strewn waters of the North Sea to attempt to rescue those in peril on the sea. John Freeman has created several such studies of historic events. His ability to combine historical detail and great atmosphere result in paintings which give considerable initial impact and much detail to hold and feast the eye. In this work John Freeman does not attempt to portray one particular launch, but to mould images of old Whitby, anecdotal information and studies into one all-embracing image. With his watercolour technique he has created a blustery night, scudding clouds and powerful movement contrasting with the huddle of apprehensive fisherfolk watching and waiting... This is the third major lifeboat piece. 1,000 signed limited edition prints have been produced. All 1,000 prints are printed on acid free paper using fade resistant inks. No print of painting benefits from exposure to sunlight. A combination of blue and grey mounts will enhance this print. Signed print approx 17"x12"